On June 15th the BBC news website reported that a £40m 15 years long restoration of St Paul’s cathedral by “state-of-the-art conservation techniques” had recovered Sir Christopher Wren’s “original vision” and left the building “as fresh as the day it was completed”. Major restorations invariably generate breathless accounts of recovered original glories made by vanquishing the “grime of centuries” – but grime only ever dates back to the previous restorations. At St Paul’s these were in the early and late twentieth century and the proposals for this last restoration explicitly declared that far from returning the interior to Wren’s original painted scheme, it would be stripped to a never-intended, never encountered state of bare-stone whiteness – see Part 1. As for the operation being “state-of-the-art”, consider these defensive/confessional remarks by David Odgers, of Nimbus Conservation, in 2005 just after the remains of Wren’s paint had been stripped: “Being completely inexperienced in the use of the material at the beginning, the learning curve was steep and problems of protection, health and safety issues and night time application had to be addressed”. This is the story of that learning curve. The method used for cleaning the St Paul’s interior was novel and experimental but as such it was unproven. In both its composition and its effects it earned censure from leading conservation experts (see below). The cleaning agent was an adapted, commercially available, latex rubber poultice laced with a mix of chemicals that were said to comprise an agent tailored to be similar to the mild alkalinity of Portland stone – a special version of the “Arte Mundit” water-based paste manufactured by the Belgian company FTB Restoration. The instigator/director of the restoration, the architect and the 17th Surveyor to the Fabric at St Paul’s Cathedral, Martin Stancliffe, admitted (at a lecture on October 21st 2003) to having slim knowledge of matters chemical and of having devolved – “entrusted” – responsibility for the application of the new paste to the Nimbus conservators (who were learning on the job while the cathedral remained in full commercial and ecclesiastical use). This state arose despite Mr Stancliffe’s boast that Nimbus had been selected as contractors after “the optimum formulation of the material had been achieved.” In practice, Nimbus, being entirely unfamiliar with this supposedly thoroughly researched and tested material, found its application by hand to be “slow, messy and to leave a streaky appearance on the cleaned stone.” Thus, when this multi-million pounds single-sponsor restoration was approved and underway it was discovered that: a) the result would look awful; b) it would take forever; and, c) it was leaving a terrible smell (of ammonia) throughout the cathedral. With the restoration in full progress, the manufacturer went back to the drawing board and radically changed the paste’s approved composition and method of application. It has not been made clear of what the chemical changes consisted or whether approval for them was obtained (see below). 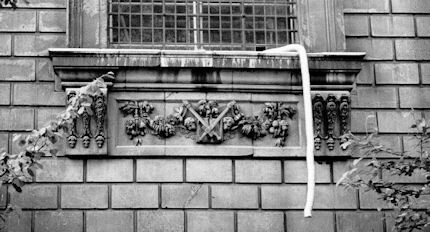 With thousands of square metres of stonework to be cleaned, FTB Restoration devised what Mr Stancliffe and Mr Odgers described as “a method for spraying on the material using compressed air with a specially designed pump and nozzle”. This enabled each restorer to apply in “only a few minutes” up to 3.5kg of chemically laced latex paste per square metre (See Figs. 1,2,3,4 & 5). The industrial speed of application – between 50 and a 100 square metres a night – and, with it, the wider commercial prospect of buildings remaining open to business during interior restorations, caused great excitement in the upper tiers of heritage administration. With 2m visitors a year to St Paul’s and admission charges then at £6, now at £14.50, closing St Paul’s during the interior restoration would likely have lost something in the region of £50-60m, but, as we will see, the technical “solutions” to the initial unanticipated problems created serious consequences of their own. Approval for the Arte Mundit cleaning method had been given by The Cathedrals Fabric Commision for England in November 1999 following claimed earlier approvals by a bevy of heritage watchdogs: English Heritage; SPAB – The Society for the Protection of Ancient Buildings; The Victorian Society; and The Georgian Group. It is not possible to establish the precise chemical basis on which formal approval was given by the CFCE because, in breach of good conservation practice, the three technical parts of the eight parts submission document have been withheld on grounds of commercial confidentiality. For information on technical matters we must rely on the cathedral’s own fluctuating (and self-contradicting) published accounts, on our correspondence with Mr Stancliffe (which was terminated by him in March 2003), and on documents obtained by cathedral employees whose health was affected by the restoration (see below). In December 2002, Mr Stancliffe and Mr Odgers gave a joint account of the ongoing restoration in Conservation News. They explained why the Arte Mundit poultice method had been adopted and why the so-called “Mora Poultice” method had been rejected. It might be noted that the latter is a cocktail of thixotropic paste, sodium bicarbonate, ammonium bicarbonate, detergents and the aggressively powerful chelating agent EDTA – ethylene diamine tetra-acetic acid. That poultice had been designed for cleaning marble buildings and was used experimentally on Michelangelo’s Sistine Chapel ceiling frescoes to disastrous effect (see our post of April 1st). 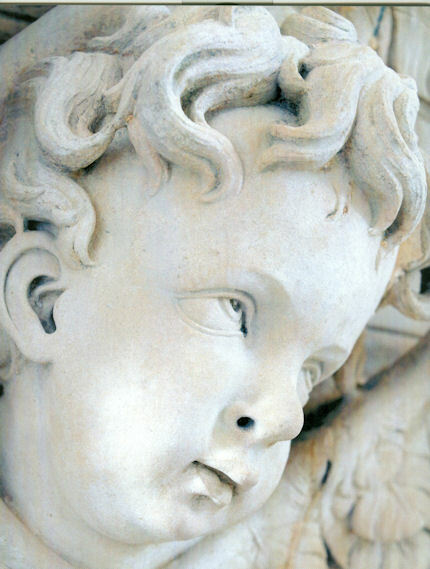 By 1992 research had shown that the brightness produced was not a product of marble surfaces having been cleaned but of their being etched by the EDTA into dissolved irregularities which scatter light in all directions. It was thus known before this restoration began that consuming stone is a consequence of EDTA levels being either too high or left too long on the surface. The Mora poultice was also rejected because the copious amounts of water needed to remove it would have turned St Paul’s Portland stone brown when, as we saw in Part 1, Mr Stancliffe’s ambition was to produce white stripped-stonework in defiance of Wren’s original warmly toned oil painted decorative scheme. Mr Stancliffe and Mr Odgers reiterated in their joint Conservation News article, that the chemical composition of their Arte Mundit paste had been “specifically formulated” after a great deal of research (but by then the research seemed to have run into the restoration itself). While it had been found necessary at the outset to add EDTA to the latex paste, they said, this had been done only “at a concentration of 2000mg/kg (0.2%)” precisely to avoid injuries to stone when used at solutions of 11% in the Mora poultices. Before discussing the hugely varying EDTA levels seen to have been used at St Paul’s, consideration should be given to Arte Mundit’s initial principle cleaning ingredient – the pungent alkali ammonia. Sprayed applications compound the health risks associated with hazardous chemical products. Although Mr Stancliffe and Mr Odgers admitted “the downside of using compressed air is that the Arte Mundit is applied as a fine particulate and releases ammonia into the atmosphere”, they seemed to regard this as a nuisance rather than a threat to health. Until then, as they put it, the paste had “contained ammonia” but, because “St Paul’s is visited by thousands of people each day, it would be inappropriate for the Cathedral to smell of ammonia.” They added that “Recent developments have meant that the concentrations of ammonia have been significantly reduced in the Arte Mundit so that potential risk has been minimised.” It was not there said of what the “developments” consisted or to what figure the ammonia had been reduced, but it was admitted that atmospheric concentrations of ammonia (which is generally detectable at 4ppm) had reached 10ppm in the cathedral. Needless to say, reducing the smell of the most pungent chemical ingredient is not the same as eliminating or reducing the risks presented by all the chemicals present in the sprayed paste. When in October 2002 a member of the cathedral’s staff who had suffered severe skin afflictions requested a copy of the manufacturer’s material safety sheet (Figs. 10, 11 & 12), she discovered that the paste was then containing EDTA at up to10% – which is to say, almost the same as in the discredited (and rejected) Mora Poultice, and therefore at up to fifty times greater than the figure shortly to be claimed by Mr Stancliffe and Mr Odgers in the December Conservation News. That safety sheet was no rogue document. In March 2003, when declining to answer our questions on inconsistencies in the official accounts, Mr Stancliffe produced certain “fact sheets” which, he averred, “answered all potential questions which you or anyone else may have on this aspect of our interior cleaning programme.” The sheets (entitled “The Arte Mundit Fact File”) were models of un-clarity and consisted entirely of questions jointly put to the restorers and to the Arte Mundit manufacturer by themselves, along with the answers they gave to their own questions. 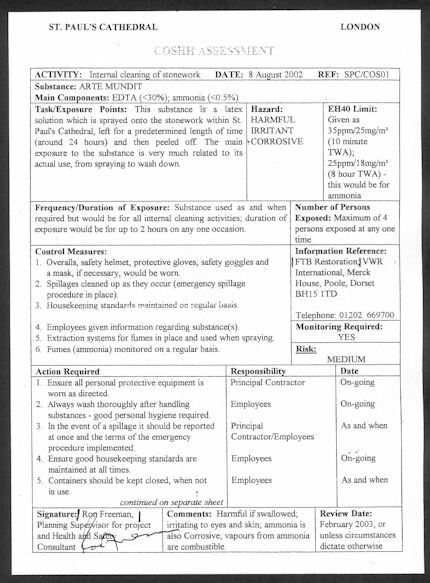 Thus, to “What controls are in place to ensure that the application and removal of the Arte Mundit is competently handled?” (their question 23), Nimbus/FTB replied “The contract has been entrusted to a company run by and employing accredited conservators.” This circular defence would suggest that the restorers, even while learning on the job, were judged capable of monitoring their own performance as well as the performance and the safety of their untested and still evolving methods. These “fact sheets” contain contradictory material. 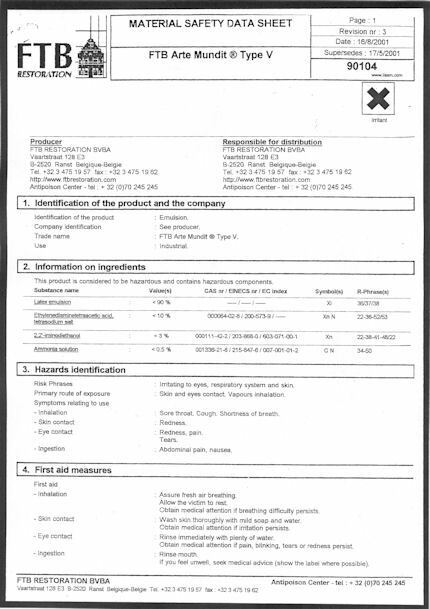 They give an account (in answer to their question 16, “Has the formulation been changed?”) of the manner in which Arte Mundit’s composition had been changed after the 1999 approval of its “optimal” formulation: “In the first fifteen months of using the material the concentration of ammonia was less than 0.5%. Further development of the product allowed to [sic] reduce the level of ammonia, which is now less than 0.005%.” This account prompts two concerns. First, the reduction of ammonia to one hundredth of its original levels is not confirmed in official restoration documents (see below). Second, in answer to question 16 it was also stated that, regardless of the claimed dramatic reductions of the ammonia level, “The level of EDTA was not changed and the efficacy of the product remained identical.” This beggars belief: there are two cleaning agents in the paste, one an alkali, the other an acid – ammonia and EDTA. If the former was reduced to a hundredth of its original level, how could the efficacy of the whole not have been diminished on the one hand, and slewed in its pH composition, on the other? And, for that matter, what is the level of the EDTA? There is no confirmation in the “fact sheets” of Mr Stancliffe’s and Mr Odger’s joint claim in the December 2002 Conservation News that EDTA was used at 0.2%. In answer to question 4 (“What are its [Arte Mundit’s] constituents?”), EDTA is mentioned as a component but no figure is given for it. In answer to question 7 (“Are there different types?”), it is said: “Yes there are five different types, Arte Mundit I, II, III, IV and V. These are similar except the concentrations of EDTA differ with the lowest concentration (less than 2.5%) being Type II and the Highest concentration being Type V. Arte Mundit I contains no EDTA.” So what type was being used at St Paul’s? To find an answer we must turn to question 15 (“What type is used at St Paul’s?”) where it is revealed that: “After tests carried out at St Paul’s Arte Mundit V was formulated by Dr Eddy de Witte to address the specific conditions found at the Cathedral.” But on this answer we learn that the type of Arte Mundit which contains the highest levels of EDTA (at up to 10%), Type V, was the very one that had been specifically developed for St Paul’s – so from where does the figure 0.2% derive? Had EDTA been required only at the Stancliffe/Odgers claimed level of 0.2%, it would surely not have been necessary to develop a special type of Arte Mundit at all, because the already existing Type II, containing EDTA levels of up to 2.5%, would more than have sufficed? When a cathedral worker whose station was next to a cleaning area complained to the Clerk of the Works on May 13th 2002 that strong smells were affecting her throat, he prepared a report (see Fig. 13) on May 17th saying that he had asked Nimbus to “get details of material, and improve ventilation”. On that day, she fell sick and was off work for a fortnight with a blocked nose and a bad chest having reportedly been told by the Clerk “Don’t worry, whatever they were using has been banned, they shouldn’t have been using it”. In the following August a Health and Safety Executive COSSH ASSESSMENT (Control of substances harmful to health – see Fig. 14) identified the main active components of the Arte Mundit paste as: “EDTA (<30%); ammonia (<0.5%)”, which is to say with ammonia still at its original (and not the claimed massively reduced levels) but with EDTA levels then at up to an astounding 150 times higher than Stancliffe and Odgers were to claim publicly in December 2002. Seemingly in the face of such attacks, accounts of the St Paul’s/FTB Restoration method shifted once more. In the May 2003 Conservation News Mr Stancliffe and Mr Odgers ignored Prof. Wolbers’ criticisms, which, they said, would be answered in a future article not by themselves but, instead, by the man who had developed Arte Mundit for the Belgian firm, Dr Eddy de Witte. Having said in December 2002 that “The original oil paint [of Sir Christopher Wren] is found to soften and can then be removed with water and scrubbing and this is both acceptable and desirable, as it is removing an unwanted and dirty paint layer”, Stancliffe and Odgers now insisted that Arte Mundit “is certainly not a paint stripper.” Apologising for having “misled” readers on the point, the pair claimed that when they had said “original oil paint” they had not been referring to the original oil paint but to “subsequent distemper applications and not to the original paint.” The distemper “is indeed softened by the latex”, they added, “as it would be by soaking with water”. At this point they admitted that the paste contained EDTA but gave no indication of whether it was at solutions of up to 0.2%, 10% or 30%. 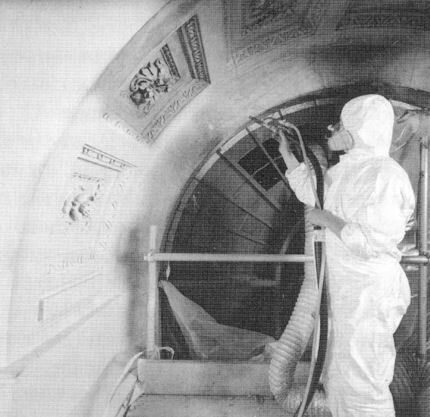 A key concern of conservationists facing such methodological discrepancies was whether or not the EDTA migrated into the stone during the periods of curing after being sprayed as a water-bound paste on to porous surfaces that had already been attacked with caustics and abrasives by previous restorers. With regard to Prof. Wolbers’ fear that Arte Mundit’s EDTA would have the time and the opportunity to invade and damage the stone yet another set of Stancliffe/Odgers claims was revised. In their May 2003 account, they claimed that the latex solution was sprayed to a depth of only 2mm and left for only “two or three hours” when in December 2002 they had said that the curing lasted “usually 24-48 hours”. 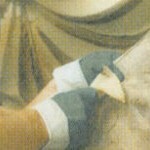 In May 2002, Conservation News reported that the latex was removed after “one to four days”. In April 2003, the BBC reported that the latex was left on the stone surfaces for between “One to four days [depending] on the thickness and temperature”. In December 2002, Stancliffe and Odgers had claimed that after removal of the Arte Mundit paste and subsequent washing and scrubbing, the stonework “still retains a patina”. In May 2003 they admitted that John Larson had rightly pulled them up for their “inappropriate use of the word”. Today the surface of the stone can be seen to have been left porous, susceptible to invasion by pollution, and chalky. Its weakened surface can now be rubbed away with a wipe of dry cloth – see Figs. 15 and 16. Fig. 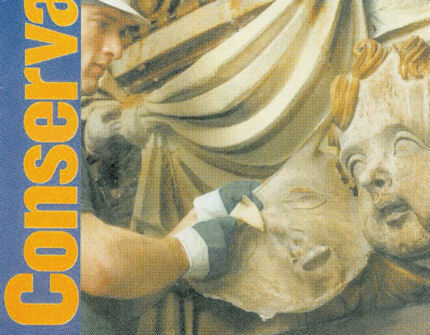 1, above: a conservator removing a latex “cleansing pack” from a carved head at St Paul’s Cathedral, as published on the cover of Conservation News in May 2002. The journal reported that the latex was left on the surface for “one to four days” and that after its removal, the stone was cleaned with “damp sponges and bristle brushes“. Fig. 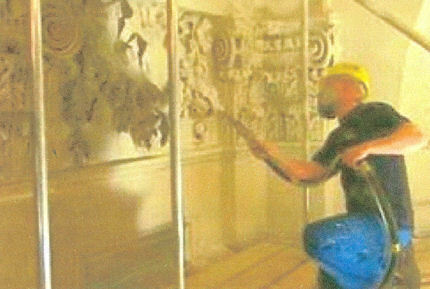 3, above: a Nimbus conservator spraying Arte Mundit Type V latex paste onto carved decorations at St Paul’s Cathedral, as shown on the BBC’s science programme “Tomorrow’s World” on April 24th 2002. The programme reported that the latex was left was left to “cure” on the stone for “between one and four days”, depending on the thickness and temperature. Notice the thickness of the overhanging latex accumulations. It was later claimed in the 2003 “Arte Mundit Fact File” that spraying was applied to “a maximum thickness of 2mm”. Fig. 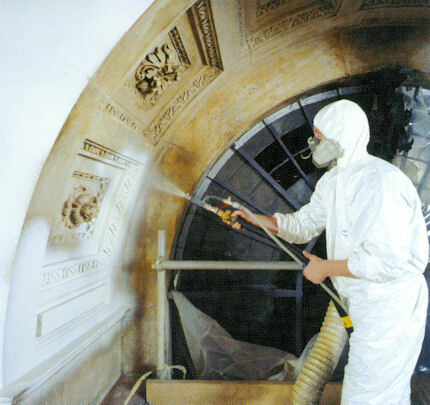 4, above: a (better protected) Nimbus conservator spaying Arte Mundit paste at St Paul’s Cathedral, as shown in the programme to the celebratory June 2005 Choral Evensong. Fig. 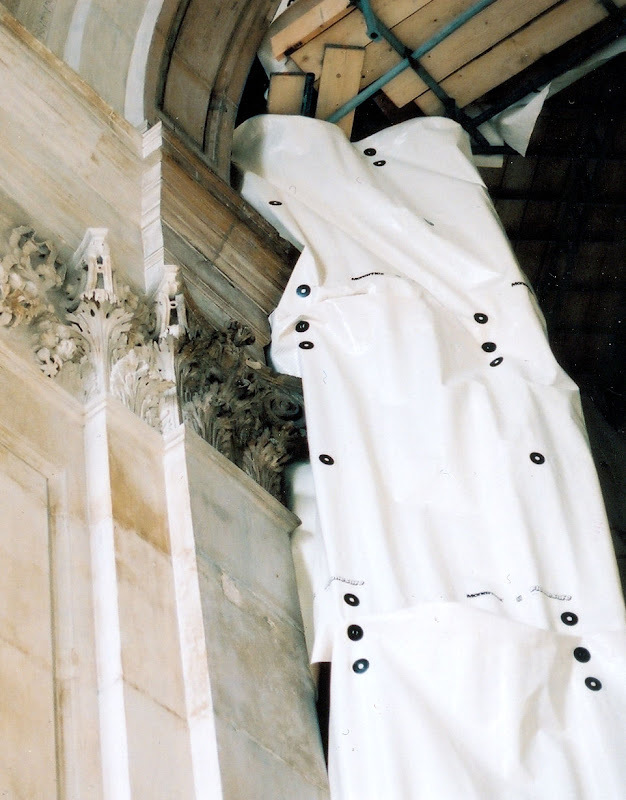 6, above: a section of monarflex sheeting descending from a spraying area in the South Transept during 2002. Fig. 7, above: a section of monarflex sheeting under the Dome. Fig. 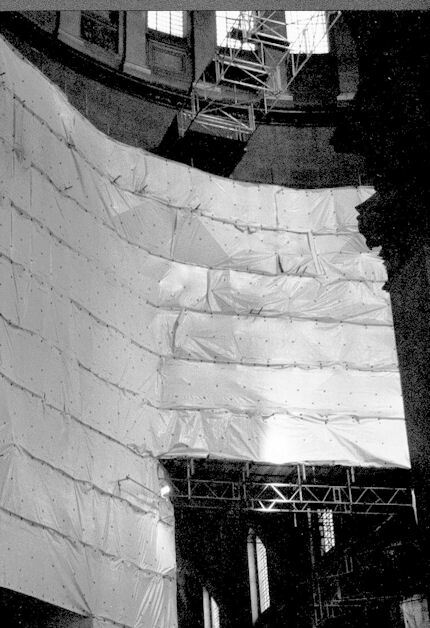 8, above: a section of monaflex sheeting under the Dome. Fig. 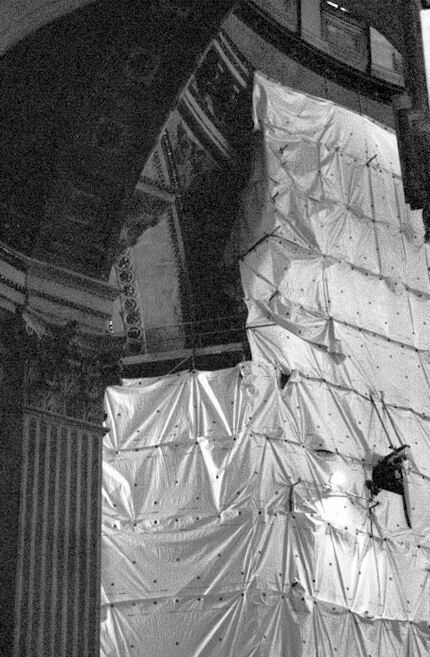 9, above: a section of extraction ducting carrying fumes and fine sprayed latex and chemical particulates outside of the cathedral. Fig. 11, above: the second page of FTB Restoration’s Material Safety Data Sheet for its Type V Arte Mundit latex paste. Fig. 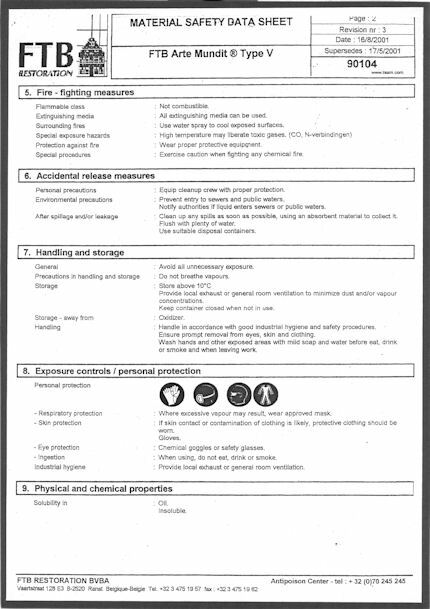 12, above: the third page of FTB Restoration’s Material Safety Data Sheet for its Type V Arte Mundit latex paste. Fig. 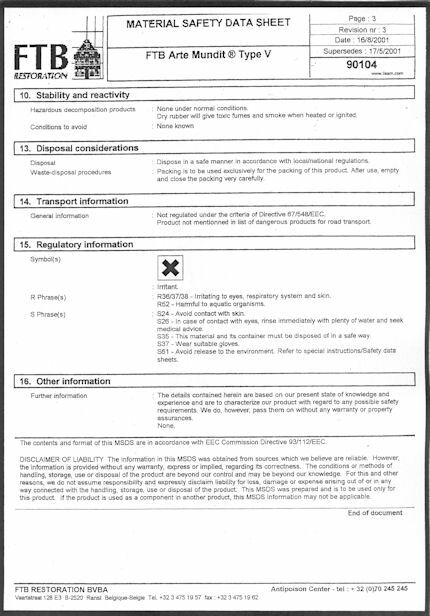 13, above: a Health and Safety Executive COSHH (Control of substances harmful to health) Assessment of the Arte Mundit paste being used at St Paul’s Cathedral on August 8th 2002 (fifteen months into the restoration of the interior). Note that, at that date, the main ingredients identified were EDTA, which was being used at solutions of up to 30%, and ammonia, which was being used at up to 0.5%. Fig. 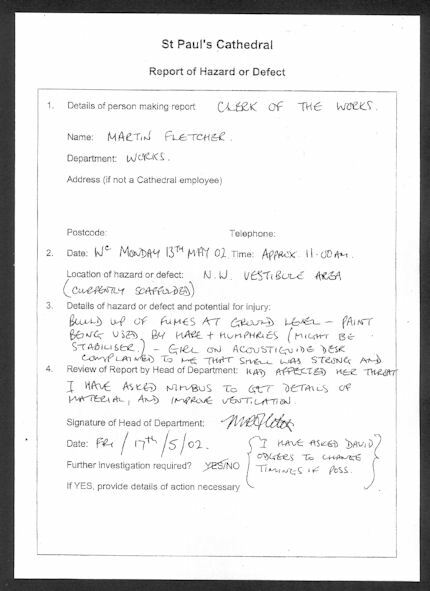 14, above: an internal St Paul’s Cathedral Report of Hazard or Defect, issued on May 17th 2002 by the cathedral’s Clerk of the Works in request of information on materials being used, and calling for improvements to be made to ventilation. Fig. 15, above: the sleeve of the author’s jacket as photographed in the South Transept of St Paul’s Cathedral on July 1st 2011. Fig. 16, above: the sleeve of the author’s jacket after being brushed against stonework seven feet from the ground, in the South Transept on July 1st 2011. Fig. 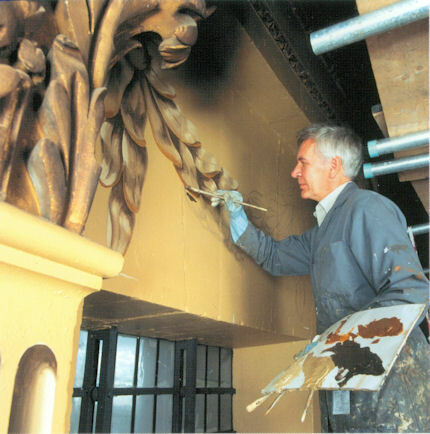 17, above: a member of the specialist decoration firm Hesp and Jones recreating one of the fictive swags that formed part of the original decorative scheme of the Tambour – the truncated conical band of windows and wall on which Thornhill’s painted Dome rests. This recreation constitutes one of the most successful treatments at St Paul’s. It merits and will receive separate discussion.